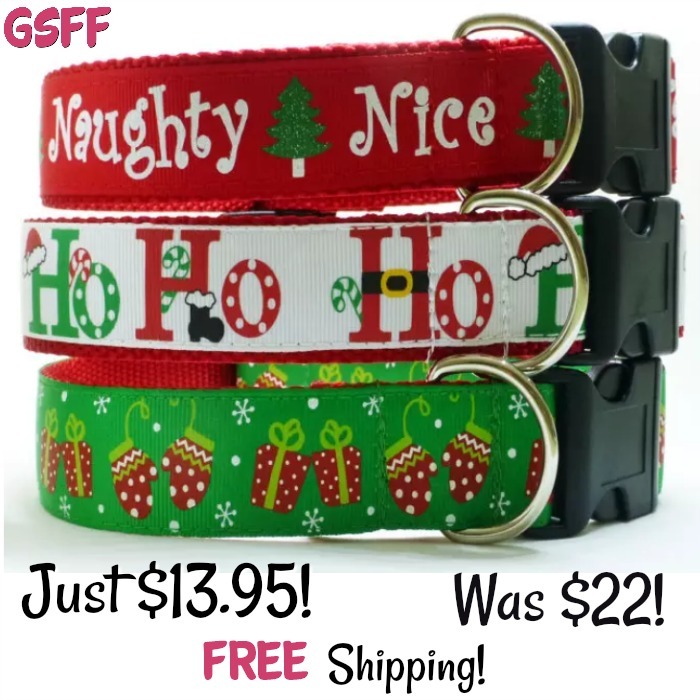 Holiday Dog Collars Just $13.95! Down From $21.95 PLUS FREE Shipping! You are here: Home / Great Deals / Christmas Deals / Holiday Dog Collars Just $13.95! Down From $21.95 PLUS FREE Shipping! Check out these oh so cute Holiday Dog Collars! Right now, they are just $13.95, down from $21.95! PLUS FREE Shipping! These super strong, yet light-weight Holiday themed dog collars are made with Holiday-themed grosgrain ribbon to make them extra cheery for the upcoming season! Our dog collars are handmade in North Carolina, one collar at a time. The dog collars are constructed using top quality commercial grade hardware, Holiday themed grosgrain ribbon and backed by heavy-weight nylon webbing that is so durable and incredibly soft. The hardware used on all of our dog collars consists of a curved side release buckle, designed to safely protect and hug your dog’s neck, an adjustable slider, and a thick nickel plated D ring. The dog collars in the picture shown are all made in the 1″ width. MEASURING FOR COLLAR: Before purchasing, measure your pup’s neck circumference while he or she is sitting. Please make sure the measuring tape is not pulled too tight or left too loose and is held where your pup’s collar usually sits. Please allow 2 fingers of extra room around your pet’s neck.